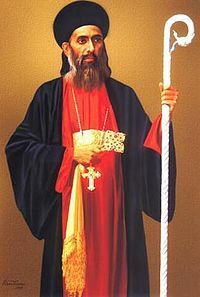 Saint Geevargese Mar Gregorios, popularly known as Parumala Thirumeni (Bishop of Parumala), (15 June 1848 – 2 November 1902) was a bishop of the Malankara Syrian Church. He became a deacon at the age of 10, a priest at the age of 18, and a bishop when aged 28. He died at the age of 54 and was buried at St. Peter and St. Paul's Church, Parumala, in Kerala, India. In 1947, he was declared a saint by the Malankara Orthodox Syrian Church, making him the first canonised Christian saint from India. In 1987, the Syriac Orthodox Church also recognised him as a saint. Gregorios was born as Kochu Ipeora Gheevarghese in the priestly family of 'Pallathattu Thanagattu in the village of Mulanthuruthy near Cochin, India on 15 June 1848. His parents were Mathai Gheevarghese and Mariam Gheevarghese. Geevarghese’s mother died when he was a small boy and since then he was under the loving care of his elder sister Mariam. At a very young age itself Geevarghese had shown keen interest in spiritual matters. His devotion, humility and above all his ability to sing the traditional Syriac hymns beautifully and perfectly, came to the notice of his uncle Malpan Geevarghese Kassiso. The uncle wanted his nephew to be raised to priest-hood and the family members who knew Geevarghese's character too agreed to the Malpan's request. At the age of 9, on the 'Sleeba Perunnal' day (Feast of the Cross) of the year 1857 (Kanni 14, M.E.1033 / September 26, 1857), the then Malankara Metropolitan Palakunnath Mathews Mar Athanasius ordained the young Geevarghese, a 'Kooroyo' (sub-deacon), at St. George Jacobite Syrian Cathedral, Karingachira. Gregorios was taught by his uncle Kassisso Geevarghese Malpan and was ordained as a deacon on 14 September 1858 at the age of ten. He continued his training with Malpan until the latter died from smallpox. Gregorios was also infected with smallpox but survived. He was ordained as a priest in 1865 and as a Ramban (monk-priest) by Joseph Mar Dionysios in 1872. On 10 December 1876, the Patriarch of Antioch, Ignatius Peter IV, promoted the 28-year old Gregorios to be a bishop, at which point his official name became Geevarghese Mar Gregorios. His youth caused him to be referred to as Kochu Thirumeni (Young Bishop). In his bishopric, which was the Niranam Diocese, Gregorios established various churches and was the motivator to establish schools in different parts of Malankara. In the late 1890s, many educational institutions were started by the Malankara Church under the initiative and guidance of him and Joseph Mar Dionysius. Examples of these include St.Thomas School at Mulanthuruthy, St. Ignatius School at Kunnamkulam (named after Ignatius Peter IV), and the Syrian English School (now known as MGM High School) at Thiruvalla. Following the death of fellow Metropolitans (bishops), the administration of Thumpamon and Kollam dioceses also passed to him. In 1887 the first block of the Parumala Seminary was consecrated. By 1895, Gregorios had made Parumala his main spiritual centre. The church that he founded there in that year was consecrated in the names of St. Peter and St. Paul. He would wake at 4 am for prayer and he fasted on Wednesday and Fridays, as well as during Lent. Geevarghese visited Jerusalem in 1895. He visited almost all the important places of Christendom and led the Passion Week services at Syrian Church in the Holy City. On his return, he collected a certain amount from all the Parishes in Malankara and sent a Silver Cross as offering to the Holy church in Jerusalem. Gregorios already had stomach ulcer and it became chronic in 1902. Treatments proved futile and he died on 2 November 1902. The funeral was conducted at Parumala Church on 3 November 1902. In 1947, he was declared a saint by the then Catholicos of the East, Baselios Geevarghese II. Later, in 1987, he was declared a saint by the then Patriarch of Antioch, Ignatius Zakka I Iwas. ^ "St. Peters and St. Paul's Orthodox Church". www.webindia123.com. Retrieved 1 January 2018. Wikimedia Commons has media related to Geevarghese Mar Gregorios of Parumala.